Evidence from systematic reviews and meta-analyses support the provision of pharmacy services to a range of patient groups. This includes patient groups with high burden conditions such as diabetes, asthma, hypertension and hyperlipidaemia . Evidence is an important factor that guides the development and delivery of new clinical pharmacy services. In the context of finite resources, targeting clinical pharmacy services to patient groups with demonstrated benefits is consistent with the principles of evidence-based decision making. It is widely stated in science, however, that ‘absence of evidence is not evidence of absence’. Vulnerable patient groups, such as those with dementia, refugees, and the culturally and linguistically diverse (CALD) are under-represented in pharmacy practice research. These vulnerable patient groups are often at high risk of adverse drug events (ADEs). The provision of clinical pharmacy services for people with intellectual disability (ID) is an excellent example. In this issue of IJCP, O’Dwyer et al. present a narrative review of pharmacy services for people with intellectual disability. The conclusions that can be drawn from a literature review are usually dependent on the quality of the included studies. This review is equally important for what is not included. O’Dwyer et al. identified no randomised or non-randomised controlled studies of pharmacist services. The two intervention studies were conducted in a single institution [3, 4]. Three of the six reports of pharmacist participation in service provision for people with ID were published more than 35 years ago [5, 6, 7]. As acknowledged by O’Dwyer et al., the lack of published research does not necessarily reflect lack of service provision . It is possible that clinical pharmacists have not documented the services they provide. While examples of innovative practice undoubtedly exist, the lack of practice-based research to inform service delivery remains a concern . This is particularly true given the high rates of psychotropic use, frequent off-label prescribing, and minimal evidence for medication efficacy [9, 10]. Although there is currently no rigorous body of evidence to support provision of clinical pharmacy services to people with ID, extrapolation of evidence from other clinical areas suggests that benefits are likely . Furthermore, a recent antipsychotic discontinuation study reported that nearly half of participants with ID achieved complete discontinuation and this was associated with improved behavioural functioning . Twenty-five years ago Hepler and Strand called on the pharmacy profession to mature ‘by accepting its social responsibility to reduce preventable drug-related morbidity and mortality’ . There is an urgent need for the pharmacy profession to develop a research agenda to promote the quality use of medications in vulnerable patient groups. In the interim, however, there is a social responsibility to target services to vulnerable patient groups at high risk of ADEs for whom minimal evidence currently exists. 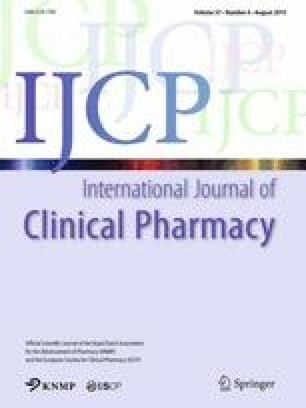 O'Dwyer M, Meštrović A, Henman M. Pharmacists' medicines-related interventions for people with intellectual disabilities: a narrative review. Int J Clin Pharm. 2015. doi: 10.1007/s11096-015-0113-4.